The Android smartphone I have now is the eighth phone I have bought since mobile phones came into play. And come to think of it, this number is just for me alone. Now, imagine the world chasing after recent mobile technology gadgets and leaving the old and dumb ones behind. The number is so devastatingly enormous I refused to imagine. The relentless popularity of social networking sites and our mobility has boosted the demand for mobile browsing and the availability of smart inexpensive communications gadgets has given many access and persuaded the same to update their mobile phones every now and then. The sad part is that, many of these phones along with other electronic accessories, which contains toxic metals such as lead, mercury, cadmium and beryllium, are not disposed of properly and worst, education how to dispose e-waste rightly is disseminated poorly, thereby, most of them end up poisoning our air and waterways. And to address this compelling environmental issue, Globe Telecom is embarking on its biggest and most ambitious mobile recycling program in the Philippines. Dubbed as Project 1 Phone, this program is designed to create awareness on proper e-waste disposal and promote sustainability. "Globe is not only dedicated to growing its business but is also committed to addressing environmental concerns and promoting human health amidst the fast growth of this high-tech industry. Being a communications provider, Globe takes responsibility in educating the people on how to dispose their old mobile devices and computers as end-of-life mobile battery packs and chargers in the best way possible," says Yolly Crisanto, Senior Vice President of Globe Corporate Communications. 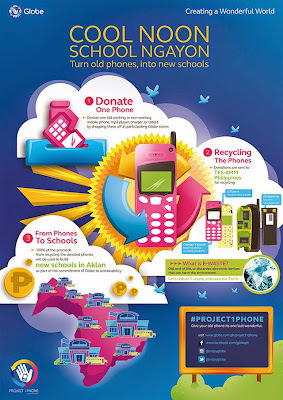 This program works by donating your old, damaged phones and tablets, mobile phone batteries and even personal computers o Globe drop in centers. Globe has made it easy for you as there will be donation bins that will be stationed in participating Globes stores in various parts of the countries. These old devices will then be turned over to TES-AMM, a leading electronics waste recycler company based in Singapore. TES-AMM will then work to recover the precious metals and plastics from the recycled gadgets. The proceeds of this recovery project will be used to help fund the construction of school buildings in Aklan. Right now, Aklan needs hundreds of classrooms to accommodate its student population which were displaced after schools were destroyed and damaged by Typhoon Haiyan almost a year ago. Globe is committed to put at least 40 school buildings in the province. Globe with the help of Habitat for Humanity and Ayala Foundation is building in two phases. The first phase will be the construction of 'Noah's Ark' type of classrooms which will also double as evacuation facility whenever there will be calamities. This will be equipped with toilet facilities and kitchens. the second phase will be the regular school buildings but 'built-back-better". This will also be co-funded from proceeds of the company-wide waste management program and as well as from parent company, Ayala Corporation. I'm keeping my old ones for sentimental reasons, but thinking about how these can help build school buildings, I think donating will be the best thing to do to let go.